Whisky and its relatives - whiskey, rye and bourbon - are made by distilling the fermented wash (wort) made from unmalted barley, malted barley, maize or rye and water. Bourbon is an American whiskey which is made from maize, rye and malted barley. Bourbon takes its name from Bourbon County, Kentucky. It must contain at least 51 percent corn spirit, plus rye, wheat or malted barley. It is distilled in a continuous still and is matured in charred oak casks for a minimum of four years. Kentucky Bourbon must be distilled and matured in Kentucky for a minimum of these years. A small batch, artisanal whiskey made form a sour mash recipe of corn and rye, distilled in our copper pot still. Barreled at a proof of 110 and aged up to five years in new Missouri oak, each barrel is carefully selected by our Artisan Distillers then blended to taste. Reserve is a subtle reminder that some things are best enjoyed slowly. Non-chill filtered | Each bottle is hand numbered and signed by Master Distiller & Co-Founder Patrick Garcia. Complex notes of creamy vanilla, maple, nougat and light smoke. In keeping with the history of the brand and to assure that only the finest quality Bourbon is labeled Belle Meade Bourbon, we painstakingly select barrels sourced from the nation’s finest distillers. To ensure that no other Bourbon in the world tastes like Belle Meade Bourbon, we created a proprietary blend using two different high-rye content mash bills and two complementary yeast strains from barrels aged between 6 to 8 years. Each batch of our proprietary blend consists of just 4 barrels and creates the signature flavor profile that makes Belle Meade Bourbon the award-winning Bourbon of choice for the discerning whiskey drinker. The high-rye blend of Belle Meade was designed to make it a versatile Bourbon. It shines whether served neat, with a splash, or on the rocks but it’s also outstanding in a well-made cocktail. The high rye content and 90.4 bottling proof helps Belle Meade Bourbon to stand up to mixers that often mask other Bourbons, thus making it the perfect Bourbon for your favorite classic or craft cocktail creation. Every fall Pinhook releases a new bourbon and rye, each of which is connected to a promising young thoroughbred horse. The whiskey in each release is the best expression of our barrels at that moment in time, and we blend and proof each release to be as unique as the horse on the label. The result is an annual vintage of Pinhook Bourbon and Pinhook Rye that become instant collectibles. And while it is impossible to know if the horse on the bottle will go all the way to the Kentucky Derby, there is no gamble on the quality of what's inside. Pinhooking is an old Kentucky term for purchasing young thoroughbreds, holding them until they mature, and selling them when they are ready to run. Successful pinhooks – much like whiskey -- are made on instinct, experience, an appreciation of quality, and a little luck. We handcraft our bourbon and rye to reflect the richness of the Kentucky soil and the character of its beautiful horse country, where we run our operations out of the newly restored Castle & Key distillery in Millville, KY.
A.D. Laws Whiskey House is a grain-to-glass distillery in Denver, Colorado that applies a “there are no shortcuts” philosophy to each batch of whiskey produced. Each batch is milled, cooked, fermented, distilled, and aged on-site, utilizing heirloom grains from family-owned Colorado farms. The practice of open air, on-grain fermentation captures the essence of Colorado’s terroir while the copper pot-column still produces a robust, grain-forward style of whiskey that is aged in 53 gallon charred oak barrels for a minimum of three years. This whiskey is crafted from the four “American mother grains”: corn, wheat, barley, and rye. There aren’t many four grain bourbons on the market because they are difficult to make. Through a labor-intensive stepped cook process (in which individual varietals require different cooking temperatures and durations to maximize flavor), each grain varietal lends its unique characteristics to the whiskey. 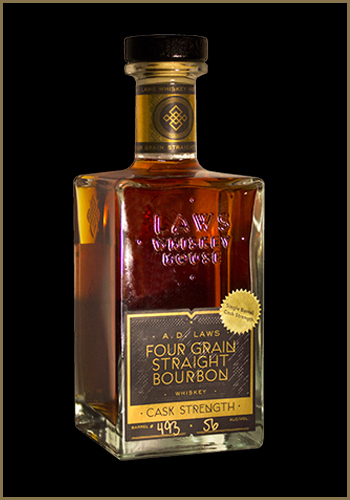 The single barrel, cask strength expression of the flagship A.D. Laws Four Grain Straight Bourbon is anything but ordinary. These single barrels are considered “The Cream” and represent the most eccentric and varied expression of our Four Grain Bourbon.